In this SearchWinIT.com e-book, learn what e-discovery is and how IT shops should prepare for the possibility. Today's laws demand that certain information be produced and made readily available as evidence in legal proceedings. IT managers are now expected to create and support a matrix of information in a way that makes sense to the legal department. IT shops that ignore electronic discovery requirements could be setting themselves up for some big costs. In this SearchWinIT.com e-book, learn what e-discovery is and how IT shops should prepare for the possibility. During e-discovery, attorneys can use the information from extracted metadata and text documents to help organize the electronic documents for review and production. 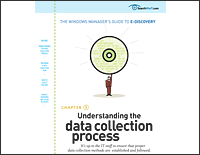 Chapter 7 explains how e-discovery processing works and reviews other tools that can help if Windows shops are required to meet e-discovery legal requirements. Storage systems, instant messaging and databases are just a few of the possible danger zones that could become problems during the e-discovery process. Chapter 6 uncovers 10 hidden e-discovery vulnerabilities to help IT managers ward off any e-discovery surprises. Improper data collection can jeopardize the reliability of data during litigation and lead to costly sanctions. In Chapter 5 of our e-book, learn what the the risks are for handling e-discovery data, how to prepare and implement an e-discovery collection plan and what happens when IT managers are called to testify. Changes to the Federal rules of Civil Procedure allow electronically stored information, known as ESI, to be requested during the discovery process in court. 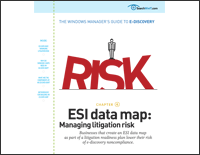 Chapter 4 examines how IT shops play a central role in helping to manage litigation risks, and how the IT staff and legal department can and should work together to create a plan for executing e-discovery requests and implementing litigation holds. What is a litigation hold and how does it affect IT shops? In this chapter, find out what happens when the legal department issues a stop destruction request and learn what to do to keep electronically stored information safe and accessible before and during a trial. As the costs associated with e-discovery increase, IT managers need to work with the legal department and security staff to organize enterprise data. This chapter describes the how and why of establishing a cross-departmental group to collect, filter and cull files that could be used for e-discovery. Chapter 1: What is e-discovery and why should IT shops care? This chapter examines what the implications of e-discovery are, why IT managers should consider standard operating systems and how e-discovery has influenced the market. It examines the tools and technologies that can help IT managers meet e-discovery legal requirements.